We L.G. PIPES & TUBES is fastest growing international suppliers, stockists & exporters of industrial raw material to world renowned companies in India & abroad providing them with world class quality material and service. Our products are supplied and accepted by our clients in various sphere of industries ranging from basic industries such as Aerospace, Marine, Ship building, Pharmaceuticals, Paper, Textile, Sugar, Dairy, Cement, Engineering to more complex such as Petroleum, Chemicals, Power, Offshore, Onshore & Nuclear Industries. We are on the approved list of major government, public & private sectors. We have dedicated sources, expertise and full technical knowledge to supply quality products as per Client''s basic and special requirements from time to time on regular basis. 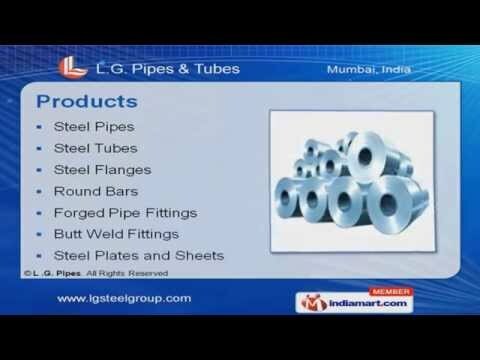 We deal in stainless steel, carbon steel, alloy steel, copper alloys and exotic nickel alloys in form of pipe, tube, sheet, plates fittings and flanges. We can fulfill our/any client''s requirement of all sizes as we stock huge amount of material from both indigenous and foreign manufactures, we also have partners in various countries through out the world to provide you to find materials at most competitive rates and superior delivery lead time. Our major advantage is our qualified workforce, we have pool of specialist in field of technical, sales and logistics, who are fully committed to provide with best solution for your business & can help you solve all your procurement problems. At L.G. PIPES & TUBES, Quality is Guaranteed. We take use of innovative and latest available technology to meet client''s full requirements regarding quality and value for money. All our material is available with full traceability records by way of Mill Certificates, Test certificates of test carried out at reputed and government approved laboratories. We can undertake supply by any third party inspection agencies like EIL, LLOYD''S, BV, GL, DNV, TUV, IRS etc. or any client''s approved TPI agency.